Languages, Literatures and Cultures announces the retirement of two esteemed German faculty members. Professors J. M. van der Laan and Charles Weeks will both begin retirement after the 2017-2018 academic year. 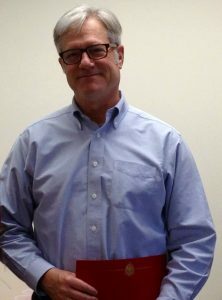 Professor van der Laan started at Illinois State in 1989 at a time when German had four full-time professors and six graduate assistants. At the time the department offered majors in French, German, and Spanish with minors in Italian, Latin/Greek, Russian, and Japanese. Professor van der Laan taught at every level in the German program, that is, courses in elementary, intermediate, and advanced language, literature, and culture, as well as other courses for the General Education and European Studies programs at the university. He weathered both bad and good times during his tenure at Illinois State, such as when the German major was at risk for elimination countered by the “number of excellent and industrious students” who pursued German. As a scholar, van der Laan devoted much of his energy to Goethe’s “Faust” and to the Faust legend, but his research interests led to publications about a wide range of topics, especially the place of technology in past and present societies. He has published numerous articles and book reviews as well as books about Goethe, Faust, and technology and society. As a scholar, Weeks’ research developed from a series of monographs to a series of critical editions and scholarly translations, which he is pleased will contribute to the permanent foundation of learning for the future. Weeks notes a high point in his research was giving the keynote at a conference held at Oxford University that led to ongoing collaborative ties with English, French, Swedish, Swiss, and Australian colleagues. Weeks plans to continue his project of edition-translation in no small part in order to maintain these rewarding ties. As they head into retirement, van der Laan’s plans remain to be seen. Weeks, on the other hand, looks forward to a return to his “youthful interest in Russia and love of Russian literature.” This summer he plans to take advantage of personalized instruction in St. Petersburg and afterwards make his way across Siberia by rail and plane. The Department of Languages, Literatures, and Cultures wish Professors van der Laan and Weeks much happiness in their retirement!